A great looking fireplace mantel is the centerpiece to any room. A fireplace can help make a room feel warm and cozy at any time of the year. There are many people whose houses include fireplaces, but others are not so lucky. Did you know, however, that a fireplace mantel can also look great against a wall without a fireplace or even around a faux fireplace? Faux fireplace mantels can create a classy, stylish atmosphere that will leave you and your guests with the same feelings as if you had a fire roaring in your home. A fireplace mantel is not just an aesthetic piece, but also a functional one as well. A faux fireplace mantel provides a great way to display your family photos or hang stockings around Christmas time. 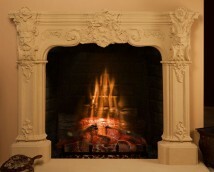 Faux fireplace mantels come in many different styles and colors. We offer fireplace mantels that are made of marble and cast stone and can have a look that is British Colonial, French country, art deco, traditional, and much more. We even offer custom fireplace mantels. If you cannot find a mantel that perfectly suits your needs, one of our experienced designers will be happy to sit down with you to discuss and design exactly what you are looking for. A faux fireplace mantel goes great in any bedroom, living room, dining room, or even in the office. A beautiful, elegant faux fireplace can really impress your clients when they come to your office for a meeting. If you are looking for a fireplace mantel, we offer the widest selection in the area and have mantels to please everyone’s tastes.